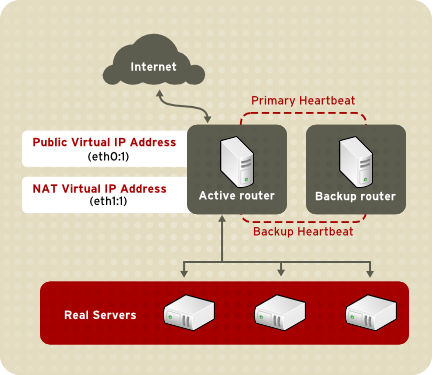 Red Hat Enterprise Linux uses Network Address Translation or NAT routing for Load Balancer Add-On, which allows the administrator tremendous flexibility when utilizing available hardware and integrating the Load Balancer Add-On into an existing network. Figure 1.3, “Load Balancer Add-On Implemented with NAT Routing”, illustrates Load Balancer Add-On utilizing NAT routing to move requests between the Internet and a private network. In the example, there are two NICs in the active LVS router. The NIC for the Internet has a real IP address on eth0 and has a floating IP address aliased to eth0:1. The NIC for the private network interface has a real IP address on eth1 and has a floating IP address aliased to eth1:1. In the event of failover, the virtual interface facing the Internet and the private facing virtual interface are taken-over by the backup LVS router simultaneously. All of the real servers located on the private network use the floating IP for the NAT router as their default route to communicate with the active LVS router so that their abilities to respond to requests from the Internet is not impaired. In this example, the LVS router's public floating IP address and private NAT floating IP address are aliased to two physical NICs. While it is possible to associate each floating IP address to its own physical device on the LVS router nodes, having more than two NICs is not a requirement.